The life of a working mum can be tricky. There’s so much juggling involved it’s amazing we’re not headhunted whenever the circus is in town. The struggle is real but it doesn’t have to be so tough. Here are 11 tips to help make the family unit run more smoothly when you’ve got to work. 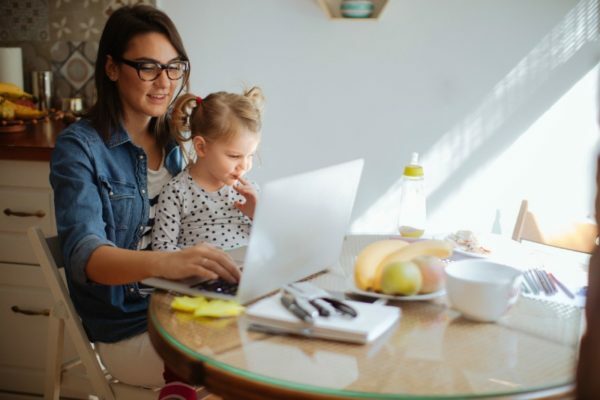 Working mums often take on more hours than they’re getting paid for, especially if they do extra work from home or at night in their efforts to resemble other full-time colleagues. So it’s important to be really clear with your boss about how many hours you can realistically do, set those expectations and then stick to them. You also need to make sure everyone else in the family knows exactly when you work too, so everyone is on board with when you’re Home Mum or Working Mum. If you have a partner then it’s vital that you both work as a team when it comes to the kids and household. Without their help things will be much harder and stressful, so do yourself a favour and sit down and work out who will be responsible for what to lighten your load. And if your partner is away a lot or unable to help out, or you don’t have one, get friends or family members involved or outsource and pay for support like cleaners and nannies. You need the help – you can’t do it alone. Babies of course can’t be expected to do anything beyond be their very cute selves, but you’d be surprised how many little things preschoolers can do around the house to help create more order and organisation. Encourage them to tidy up toys once they’ve finished playing, put their shoes on the shoe rack and put rubbish in the bin. Even having them not kick up a fuss about getting dressed when you’re trying to get out the door in the morning can be a big help, so talk to them about how much you appreciate them being a good little helper for mummy. And if you have older kids, then definitely write up a list of chores and activities around the house that they’re responsible for and praise them when they stick to it. Even though it might be the last thing you want to do, become that person who sets up everything for the next day the night before. So unpack preschool bags, put the laundry and dishwasher on, lay out clothes for the next day and iron your dress. Weekends should be a time for family fun, but make sure you also set aside a few hours to cook meals for the week so you’re not struggling to fling together a magical meal in minutes when you come rushing in the door at 6pm. Write to-do lists and stick to them, shop online for groceries and birthday presents and do a weekly meal planner so you know in advance what everyone is eating. Busy doesn’t always equal productive, but in the case of a working mama you need to make sure every minute spent is a good one. Certain tactics and environments might help you to focus more, for example try putting headphones on while at your desk, doing a 5 minute meditation before starting anything, or exercising during your lunch break to clear your mind. So figure out what works for you and make sure you remember to do it regularly to maximise productivity. This might also give you more time during work hours to knock off personal chores such as going to doctor, buying necessities or paying bills. It’s tempting to use devices like the TV in the morning to distract the kids while you run around getting yourself and everyone organised. More often than not though this tactic ends up having the reverse effect when the children erupt into tantrums when you turn it off, making it way harder to leave the house. So make the mornings a screen-free zone to encourage more calm and cooperativeness. Say no to those extra requests from your boss; you won’t lose your job over it. Say no to having those extra children over for a playdate and dinner mid-week; do the weekend instead. Say no to volunteering to be the preschool class mum organiser – you don’t have time for that! Say no to doing arts and crafts at the breakfast table – are you crazy? Because despite what you think, you CAN’T do it all, so stop saying yes all the time and push back when and where you need to. A job that involves a lot of commuting or long hours can add a lot of unwanted stress to your work day. It means you need to be out the door earlier and a higher possibility of being late for daycare pick ups due to traffic. Try speaking to your employer about exploring options that might include working from home for part of the week or working shorter hours. Or failing that, perhaps consider looking for a different job that has more flexibility. This can really come in handy for packing more into the day and making you more available for your kids – such as when they’re sick and need to stay home from preschool. You might be smashing it on the work front, but if it’s at the expense of your family and personal life then it’s not worth much. The only way to make sure you don’t neglect your personal life is to schedule it into the diary just like a work appointment or task. So diarise that catch up with your friend and hair salon appointment, put a fun family outing on the calendar, set aside time for house spring-cleaning – or whatever it is that needs to get done. Because feeling content in your personal life will make you feel more organised and productive for work. By working you’re not being a bad mother or abandoning your children, there are so many benefits of daycare or preschool for kids. And by using your mind, engaging with other adults and bringing an income into the household, you’ll also be doing your own mental health a favour which can only make you a better mum. If working isn’t working out so well and the whole family is suffering, then stop pretending it’s fine and work out another solution. This might mean discussing different income arrangements with your partner, taking a different job, getting additional help with the children or going back to being a stay-at-home mum for a while. There’s no shame in admitting something isn’t working, it just might not be the right time for you to work or you might require a different system in order for everything to function well. Remember that this is just a phase in life, it will get easier to work as the kids get older, so don’t give up. You CAN work and be a mother, you just need to find the right groove for you and do everything possible to make sure the ride is as smooth as it can be.